This is a continuation of a previous set of posts and is eighth in a series. Time to talk about resources for writing your business plan and your presentation. Sorry about the delay in preparing this next post, but January and February have been the two busiest months in memory. Lots going on at VentureLab, lots going on at Seraph Group, you name it. Okay. When I present these charts to a roomful of technology entrepreneurs, I usually ask for a show of hands at this point. Three questions: “Any English majors in the room? Any state spelling champions? Anybody who was raised in a household whose primary language was not English?” Usually there are zero hands for the first two questions, and anywhere from ten percent to half of the room for the third. Your written documentation is going to have to represent you to people who you haven’t met. It has to be your “best foot forward,” and it should represent an example of your very best work. If I read a plan that’s sloppy, or poorly written, or with misspellings and typographical errors, what am I supposed to conclude? You are stupid, and don’t know that you have made errors. You are sloppy, and don’t care that you have made errors. You are lazy, and don’t want to take the time to fix errors. You know there are errors, but you do not have sufficient skills to fix them, and you have not gone out to get help from someone who can. None of these make me want to invest in you as an entrepreneur. The first three are self-explanatory. The fourth ties into one of your key roles as the leader of an entrepreneurial startup — your ability to assemble a team of individuals who, together, are greater than the sum of the parts. It’s weird that people don’t see this. If you’re a software type, there’s no shame in hiring a hardware type to lay out your circuit board. If you’re the technical lead, everyone expects you to hire a financial type to keep the numbers straight. You can’t do everything (unless you’re Leonardo da Vinci), and you’re not expected to do everything. What you are expected to do is find people who, collectively, can do everything. If you’re no good at writing a business plan or preparing a presentation, find someone who is. First, you need to get a copy of The Elements of Style. It’s ten bucks; if you can’t afford ten bucks, you can’t afford to be an entrepreneur. Read it, re-read it, stick it under your pillow at night. Second, start channelling Edward Tufte. His first book is The Visual Display of Quantitative Information, and you need a copy. It’s not as cheap as Strunk and White (about $30 online), but that’s just the start. He has three more books at this writing, and he travels the country giving presentations about his work. The one-day course costs about $400, but you get all four books, and you get to spend a day with someone who really understands how to convey complex information cleanly and quickly. Follow this link and find out when he’s going to be in your town. Go. Finally, you ought to pick up a copy of Guy Kawasaki’s The Art of the Start. Guy has a notorious personality, and he makes a living out of letting it show, but there is a wealth of good information in this book. Good advice about all aspects of starting a company, but particularly relevant here are Chapters Two and Three. You need to create two documents for distribution: a twenty-page business plan and a two-page executive summary. Which basically means a 2-page executive summary and 18 pages of supporting material. This is hard. You are going to have two hundred pages of material you’ll want to shove into this plan. Resist the temptation. Because your target audience won’t read it. You want to get to a meeting… there will be plenty of time for details later. Cut ruthlessly. Then cut some more. An easy tip (more about this later)… cut out almost everything related to your neato-keen technology. Out of the twenty pages, you can have two on technology. Not three. Two. Because I want you to spend the remaining sixteen pages (two more got chewed up by the executive summary, remember?) talking about your team, your company history, your customers (if any), your revenue (if any), your competitors (you definitely have some), your channel strategy, your potential acquirors… you know, all that stuff that might actually make me want to invest in your company! The 20-page business plan and the 2-page executive summary should agree. That sounds obvious, but people often get it wrong. If the executive summary says you’re raising $2.5 million but the “Offering” section of the plan says you’re raising $2.0 million… I no longer care which of those two numbers is correct. All I care about is that they are different. See “stupid or sloppy or lazy,” above. At the same time, they shouldn’t agree word-for-word. If I read a paragraph (or page!) in the executive summary, then encounter that exact same paragraph (or page) later in the document, I notice. “Hmm. This entrepreneur has so little to say that he just cuts-and-pastes the same description in different places.” You can get away with that for a brief memorable tagline (ten words or fewer), but not stretches of expository text. Why? Ideally, your PowerPoint deck shouldn’t function without you standing in front of it talking. These slides (the ones I’m annotating in this series of posts) are lousy in this regard, but I’ve created them as a standalone teaching tool… and I’m not using them to raise money! I’ll have more to say about presentation slides in a future posting, but for now, try very hard to resist when a VC asks you to “just send over your PowerPoint deck.” Suggest sending the 2-page executive summary instead. If he or she insists on the slides, don’t be stupid — send them, but also send the 2-page executive summary. The summary has nice things like verbs and complete sentences which mesh better with our cognitive processes. PowerPoint slides encourage brevity to the point of meaninglessness, and whiz-bang graphics to the point of mindlessness. 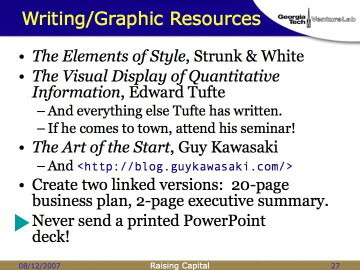 Edward Tufte does a better job of criticizing PowerPoint than I can do. I’ve already told you to buy his books… but, as a sample, here’s an explanation of how PowerPoint killed seven astronauts in the Columbia re-entry disaster. Whew! Sixteen hundred words to explain this one chart. I’ll post this now, and add more later. Yeah, commenting on my own post. Good advice halfway down on what belongs in a business plan. What do you think about posting PPT files (with narration) on slideshare.net as an alternative to emailing a pitch deck? I suspect I’d have the same problem with Slideshare as I do with podcasts — bandwidth. Not network bandwidth; human bandwidth. I can read and comprehend text at 1200 words per minute. Once it’s turned into a podcast (or a slidecast or whatever), that plummets. Which is why I never listen to podcasts. Probably not bad to have your pitch on slideshare.net as a backup, but I wouldn’t lead the encounter with it.